Wontons can also be served in variety of ways. In Vietnamese cuisine, they are usually a component in soups as in Vietnamese Egg Noodle Wonton Soup (Mì Hoành Thánh). In American-Chinese cuisine, they are fried and served as appetizers with an accompanying sweet duck sauce, or a tangy vinegar soy sauce. Below is my version of Vietnamese wontons. I like to add ground shrimp for better flavor and chopped jicama. The jicama not only provides sweetness, but it also gives a subtle crunch to the wontons. The unexpected crunch makes people ask what’s in it, and that, my friends, is where I have a little fun with my answers. Fried crickets? Human fetuses? The list of possibilities is endless. Combine shrimp, ground pork, jicama, onion, oyster sauce, sugar, pepper and sesame oil in a bowl and mix well. 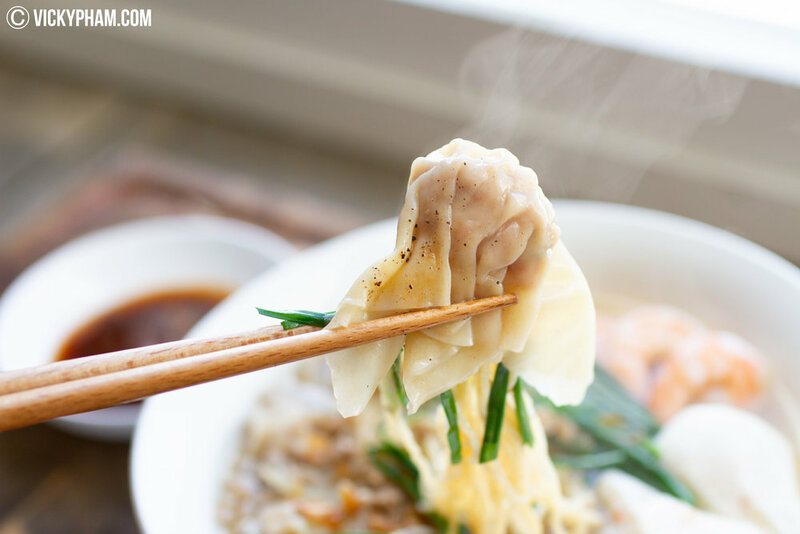 To form the wontons into simple triangles, place about 1 to 1-1/2 teaspoons of shrimp and pork mixture a bit off center on the wrapper. Brush the edges with beaten egg and fold the wonton wrapper over into triangles, while pushing the air out of the filling. Pinch the edges together to form a seal. You may also make them into fancy pleated pouches if you want to get your pleating skill on. Lightly dust each wonton with corn starch to prevent sticking and ripping. The wontons are ready for cooking. You can either boil, steam, pan-fry or deep-fry, and enjoy them as an appetizer with a vinegar soy sauce. You can also store some in freezer for a topping in Vietnamese Egg Noodle Soup (Mi Hoanh Thanh). To freeze them properly, place them in a single layer with Saran-wrap between layers to prevent sticking.